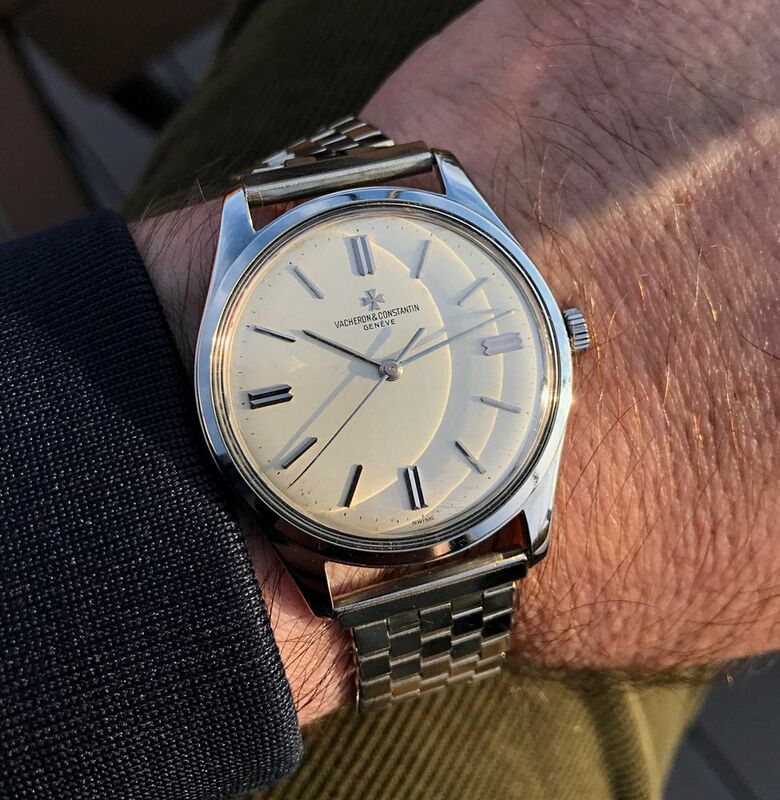 Up for sale is this uncommon and uncommonly handsome 1960s Vacheron & Constantin reference 6308 with beautiful original silver-white dial and rare large 36mm case in stainless steel, both most unusual for VCs of this era. Also unusual is that it even comes on a rather unique period white gold-filled brick link bracelet manufactured by Kreisler with signed Maltese Cross-logo buckle. 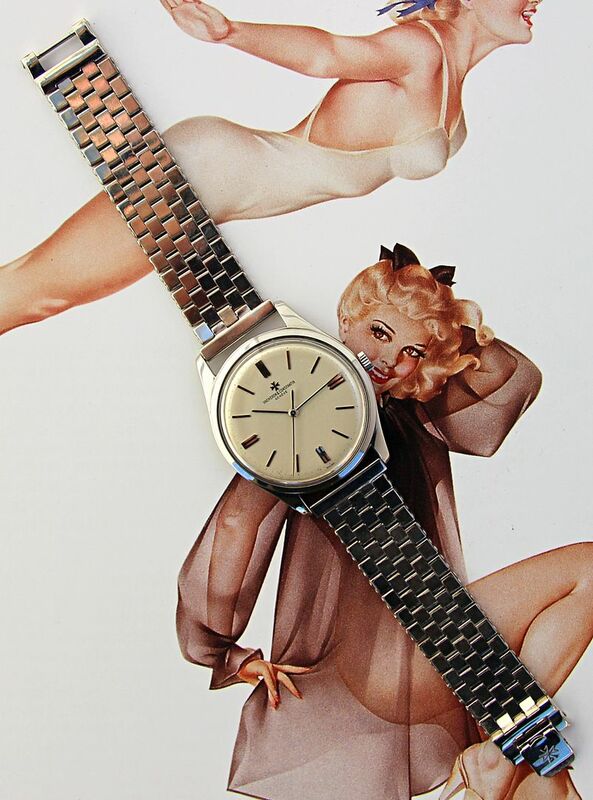 This stunning dress watch features the beautifully finished and legendary JLC-based sweep seconds cal. 454/5B under the hood, with 18 jewels, a whopping 8 original adjustments and stamped twice with the Geneva Seal. The watch was overhauled by my watchmaker when I first acquired it some years back and is still running flawlessly. 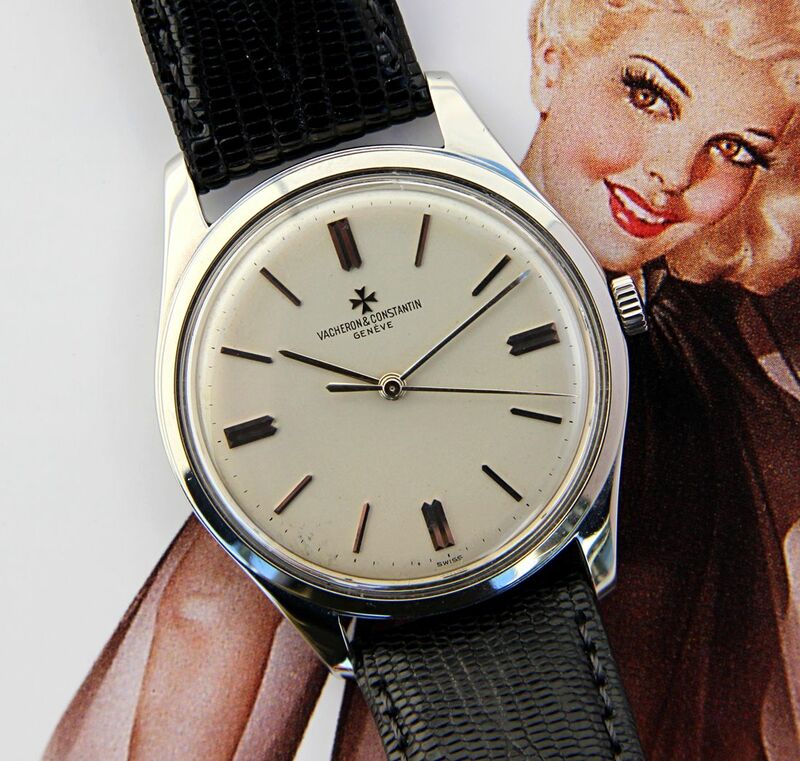 This elegant steel Vacheron Constantin is in Excellent overall vintage condition and a joy to wear. I don’t have to tell you how much it would go for if it said Patek on the dial instead of Vacheron. 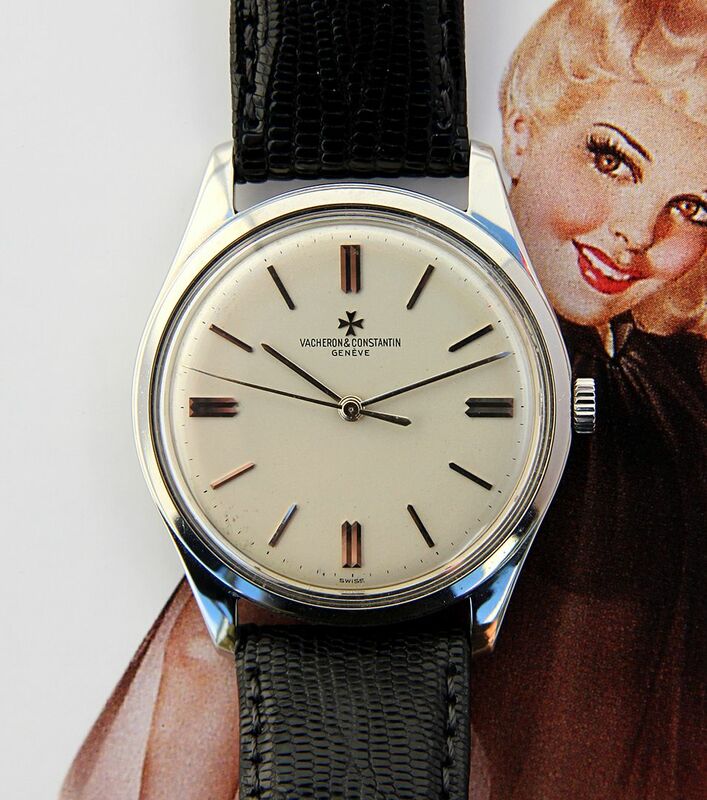 The asking price for this beautiful steel Vacheron 6308 is $6450 USD OBRO. The price includes fully insured worldwide shipping. Bank Wire strongly preferred. Other payment options upon application. Payment must be made in US DOLLARS. Watch will ship upon full clearance of the funds, as well as any necessary bank vetting. 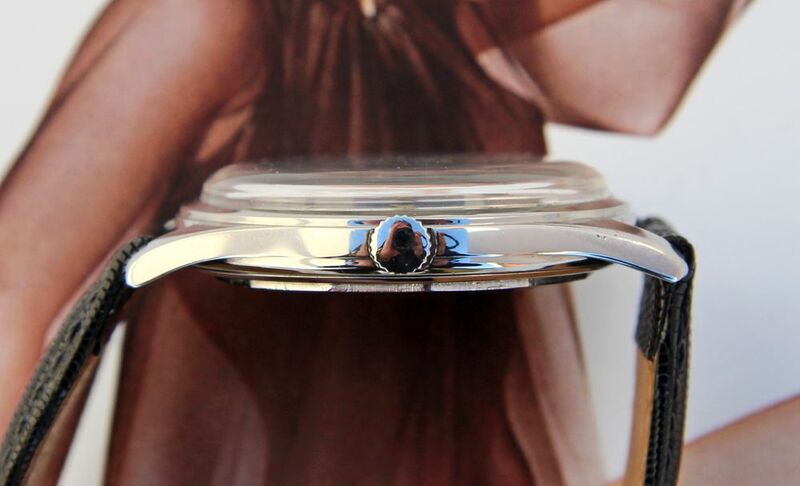 CASE & BACK: Rare full size steel case measures 36 x 42mm and a slim 9mm thick to the top of the domed crystal. 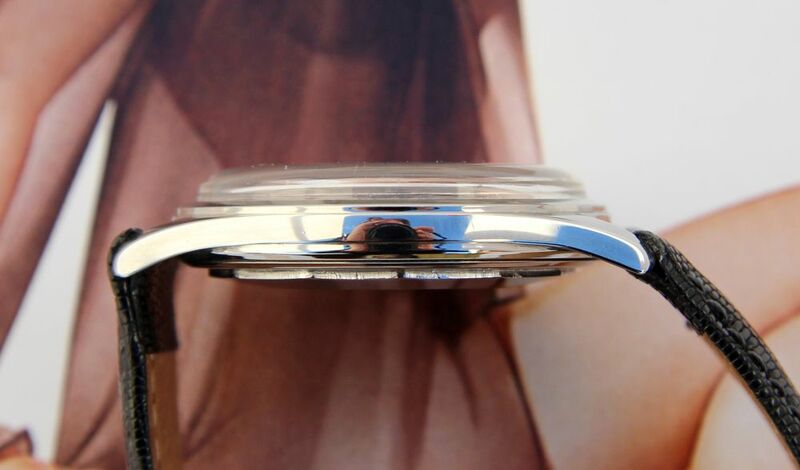 The case has a fully polished finish with the exception of the center of the back and was lightly detailed at service. 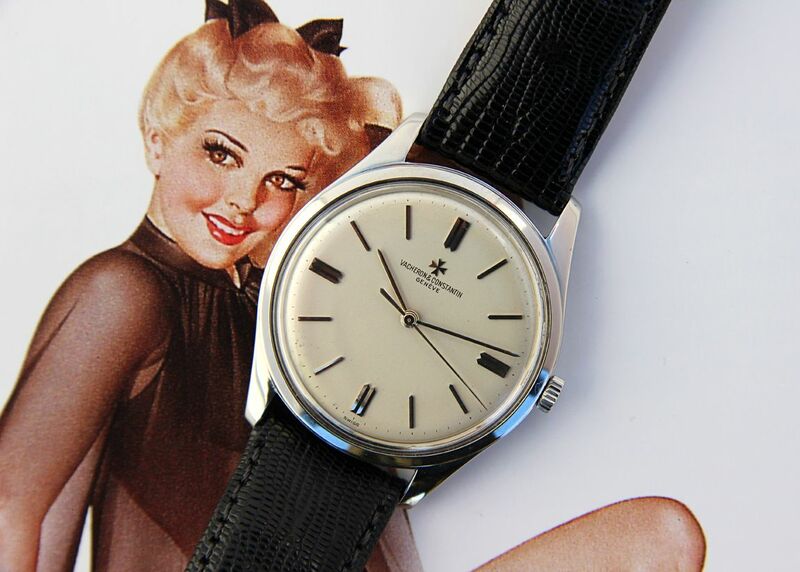 There are some remaining small marks from the years and the case and bezel are in Excellent overall vintage condition. 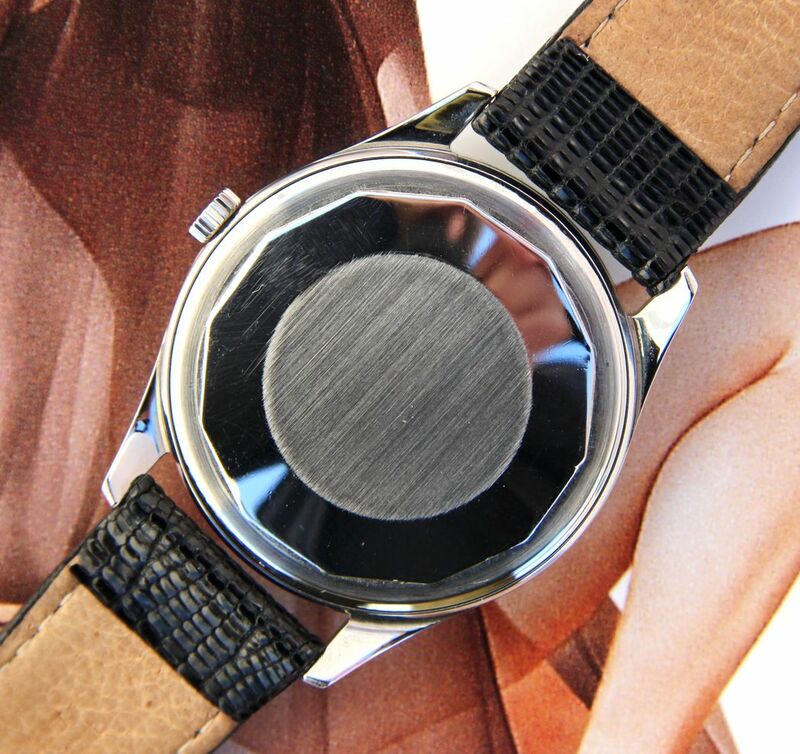 The outer water resistant polygon screw-in caseback is likewise Excellent, with a fresh satin finish to the center and some older nicks to the facets of some of the polygon edges. Inner caseback shows negligible corrosion and has the correct model number and a 373,k case serial number. 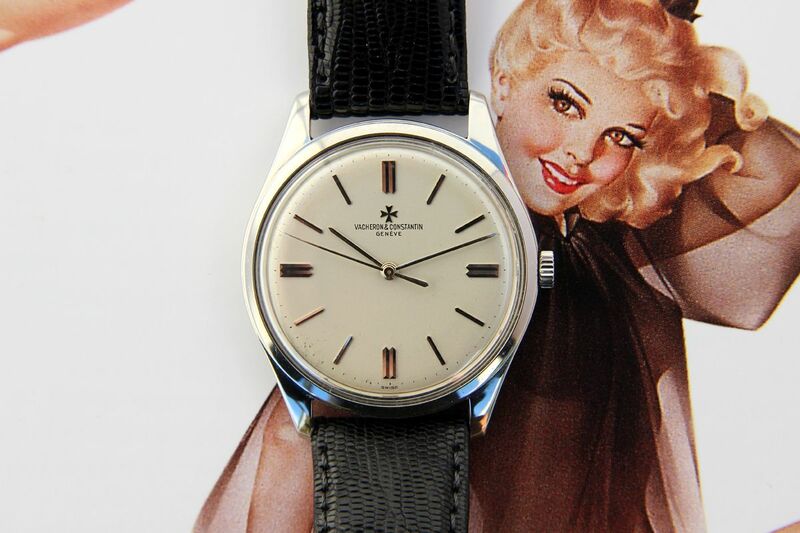 All correct Vacheron & Constantin hallmarks of the period are present. 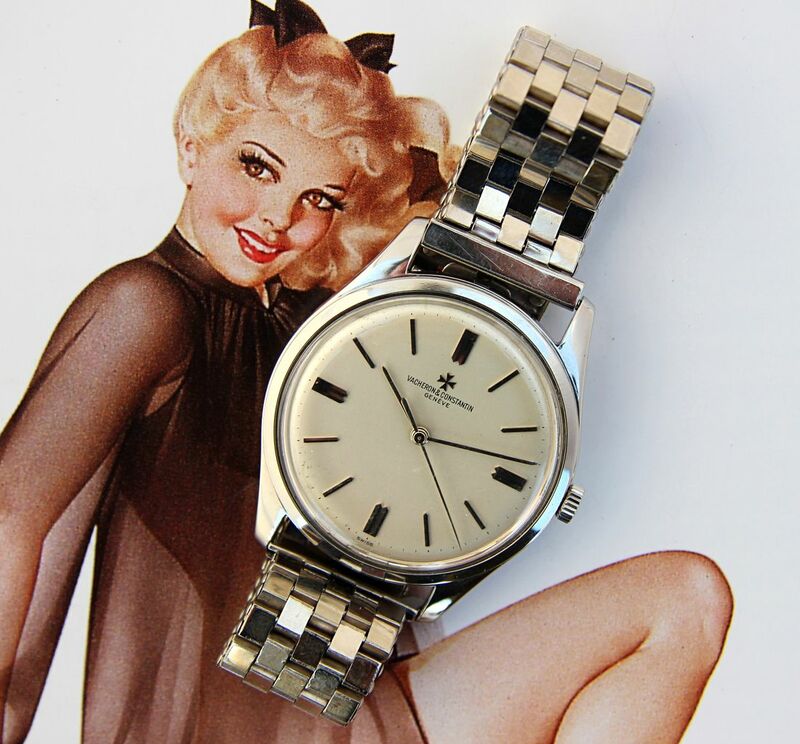 This is a beautifully proportioned watch that wears even larger than its 36mm due to the slim bezel, wide face and tapered 19mm lug width — absolutely stunningly elegant on the wrist with modern wearability! 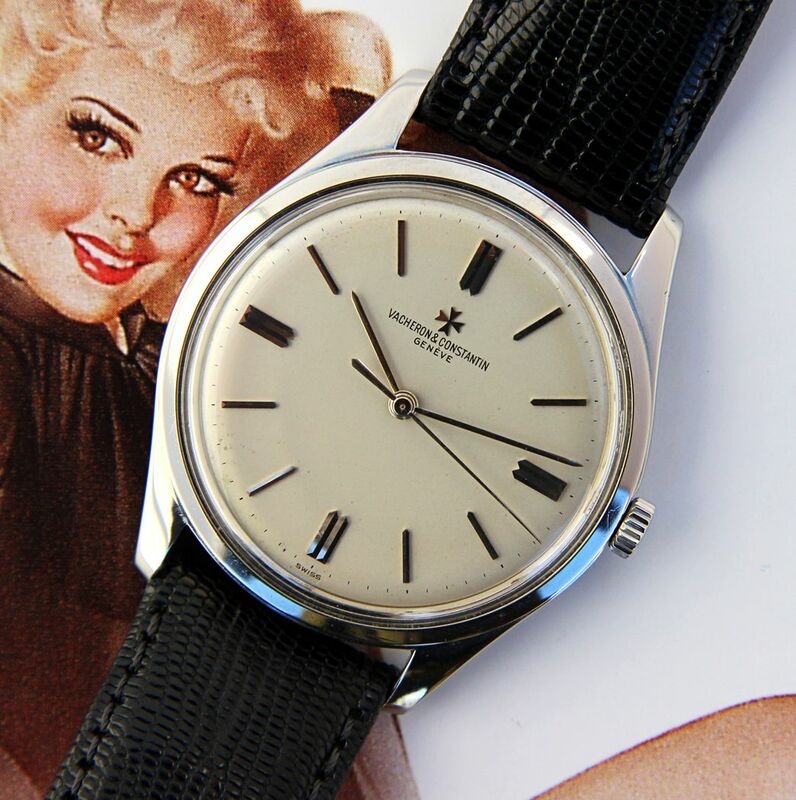 DIAL & HANDS: Excellent condition original silver satin dial that has aged to a lovely off-white eggshell tone. Fantastic symmetrical layout of applied white gold bar and double bar markers with applied Maltese cross beneath "12." All dial print is original. 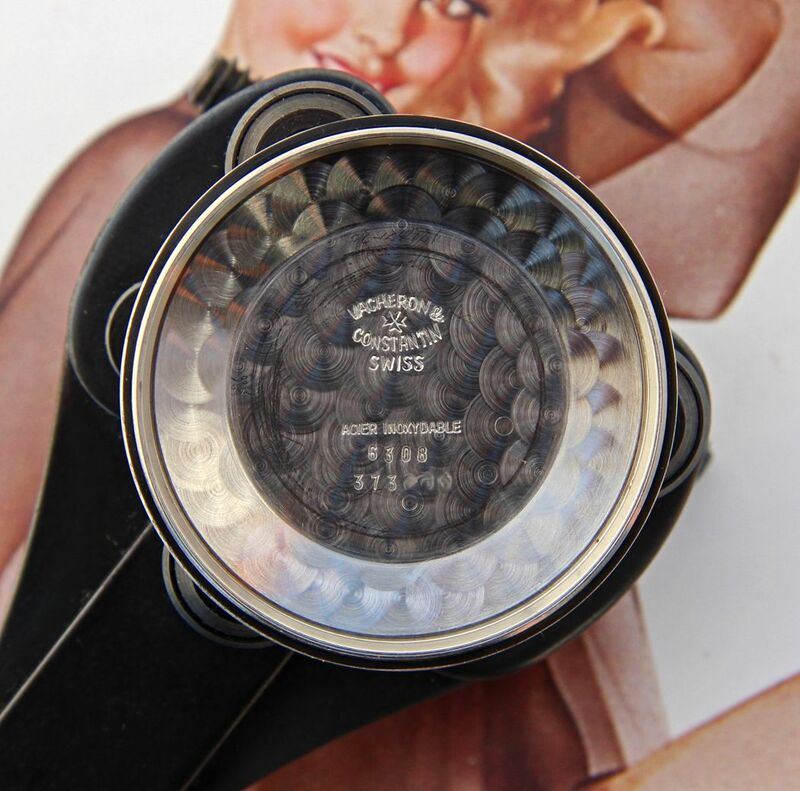 There is light surface spotting visible throughout when viewed through a loupe and what appear to be light rub marks to the surface between "6" and "7." Elegant long stick hands and baton sweep seconds are Excellent+. 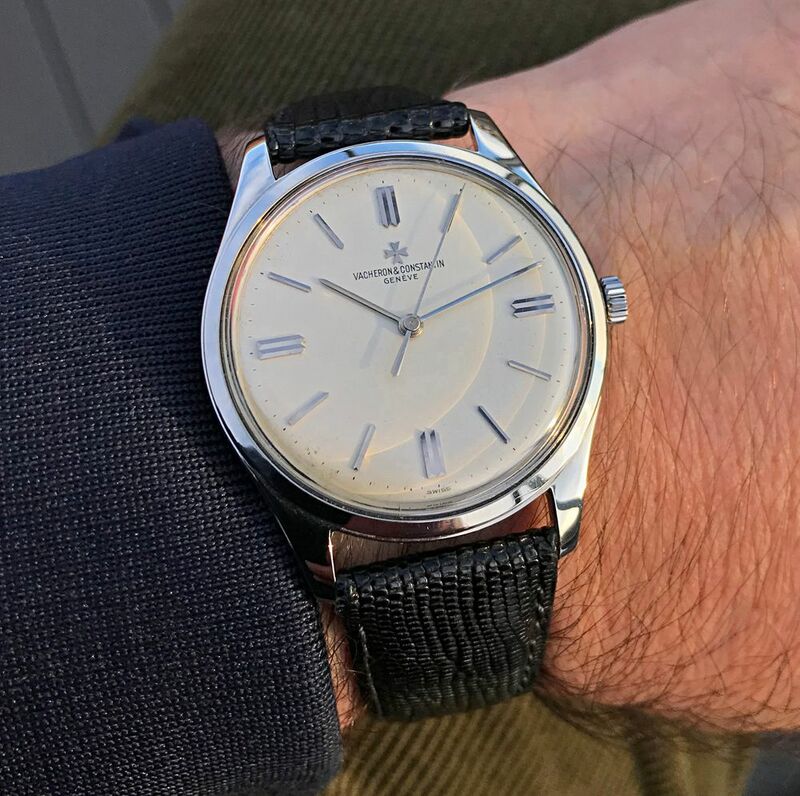 For my money this is one of the most handsome dress watch layouts I’ve ever seen — the lack of date and luminous material and the overall proportionality of the hands and markers are just really special to look at. 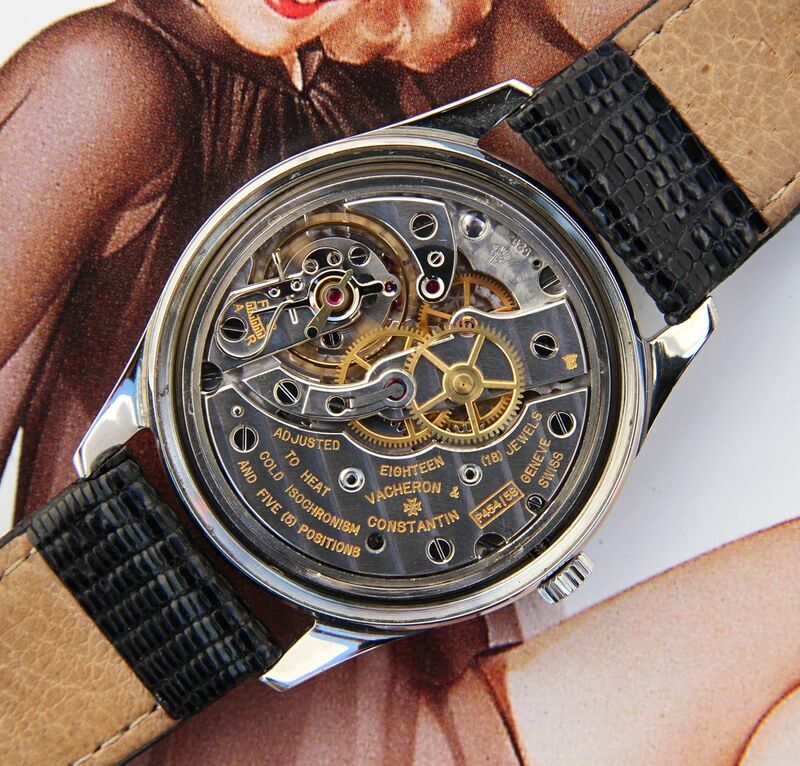 MOVEMENT: Beautiful and very high grade JLC-based caliber P454/5B 18-jewel non-hacking manual movement with indirect center seconds, originally adjusted to heat, cold, isochronism and 5 positions. One of the most highly regarded manual wind movement families in horology, this example has a 529,k movement serial and is stamped twice with the Geneva Seal on the bridge and mainplate. The Geneva Seal is an attestation of particular horological achievement somewhat over and above the usual Chronometer certification. As stated above, this watch was fully serviced when I first acquired it some years back, has been worn relatively sparingly since and is keeping great and running well. This is guaranteed to be the case at the time of shipment. CROWN: Correct original unsigned smallish knurled steel crown pulls out to the time-setting position properly and clicks back to the winding/neutral position snug against the case as it should. Wonderfully tight winding action on this great Vacheron caliber! CRYSTAL: Older domed acrylic crystal is in Very Good+ condition with a few scuffs and scratches. BRACELET & STRAP: This classic VC 6308 comes on its original period 10k white gold filled brick link bracelet with Maltese Cross-signed folding clasp. This highly uncommon bracelet was manufactured by Kreisler USA and likely also indicates a US sale originally. I like it more than I thought I would and it gives the watch a cool, flashier look if that is your thing. I had the bracelet lightly buffed when it was serviced to bring back its luster and it is in overall Excellent condition with no real stretch to speak of and just a bit of light wear and tear. It will fit up to a 7 1/2" wrist comfortably, perhaps a little larger, though I believe it will take a professional to remove links and make it smaller. This great VC will also come with a very fitting and lightly used generic thin black lizard strap with steel buckle. 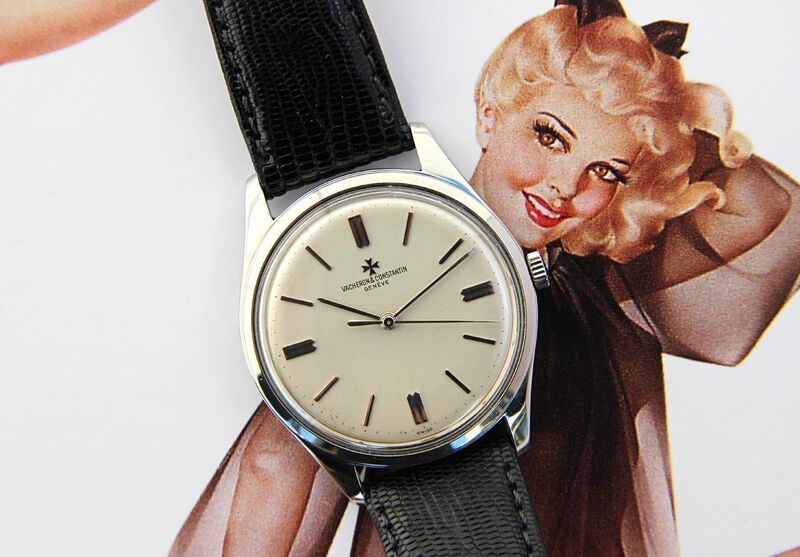 This great dress watch has a lug width of 19mm. As a matter of policy, I make absolutely NO guarantees for the water resistance of this watch. 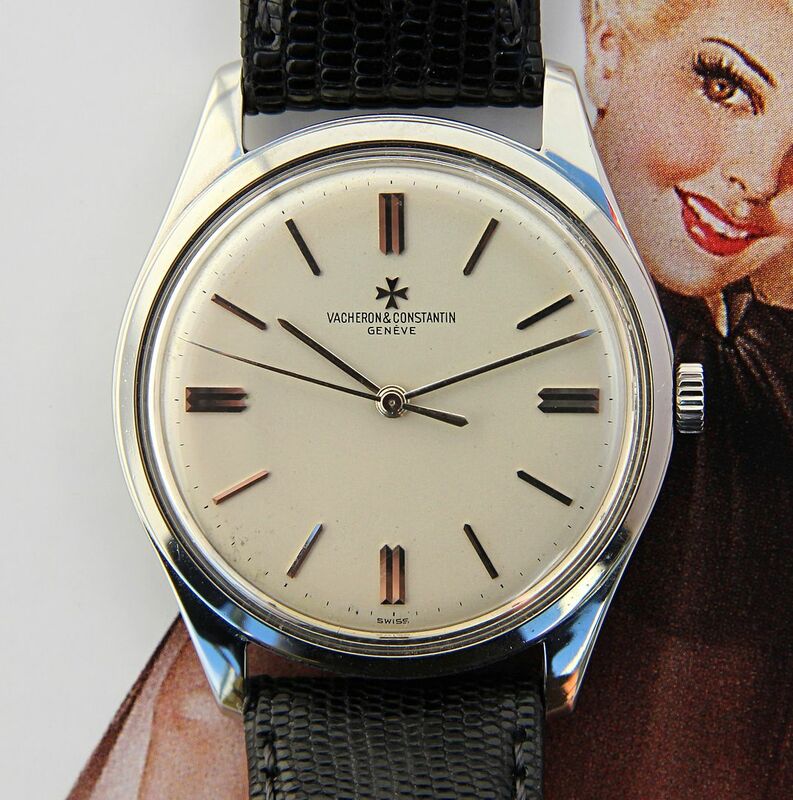 This wonderful vintage Vacheron & Constantin is offered with a 3-day inspection period from the date of receipt and may be returned for a full refund (less any shipping costs incurred by the buyer). This refund is unconditional and once I get the watch back in exactly the same condition as it was sent to you, your money will be refunded. Of course, once the 3 days are over the sale will be considered FINAL.